This is California's toughest class V stretch that is run commercially. The Middle Fork Feather is about as difficult and more remote, and the Kings Garlic Falls run seems more hazardous. Neither of those stretches is commercially rafted. On most summer weekends, there seem to be more kayakers than rafters on Cherry Creek. The two recommended portages are much easier with kayaks! Many pictures of this run (including first tuber descent) are available on this website and in a Dreamflows gallery. 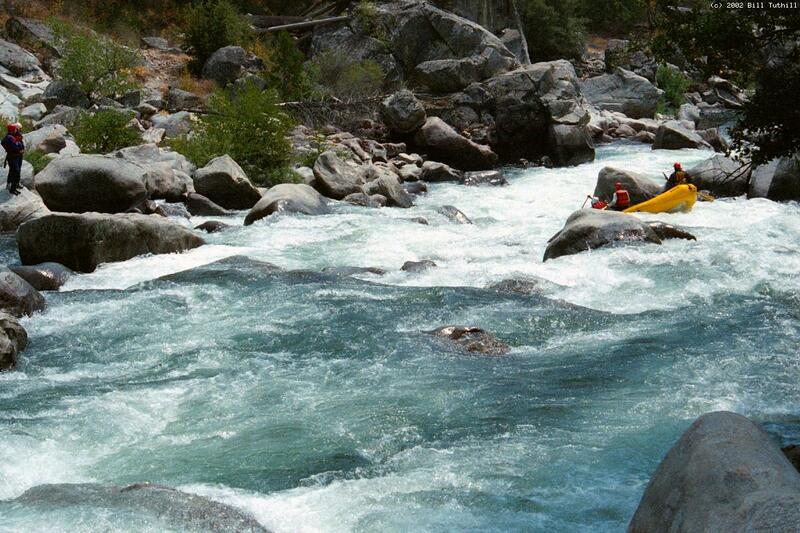 Cherry Creek into the Tuolumne is a superb class V run for hardshell kayakers, and an exciting raft run, but it is not great for inflatable kayaks. One problem is that there are many angled hydraulics, and because inflatables sit on top of the water, not slightly underwater like hardshells, so it's all too easy to tip over and swim. And when you do swim, there are many hazards, including spots where the current flows under big boulders. Expert kayakers seem to feel this is a comparatively safe run. Perhaps it is, if you follow the proper lines and have an unfailingly quick offside roll. Rafters often get trounced or beat up on this run, however. Many rapids are very technical, so precise boat control is needed to avoid flips, and swimmers should be picked up immediately. 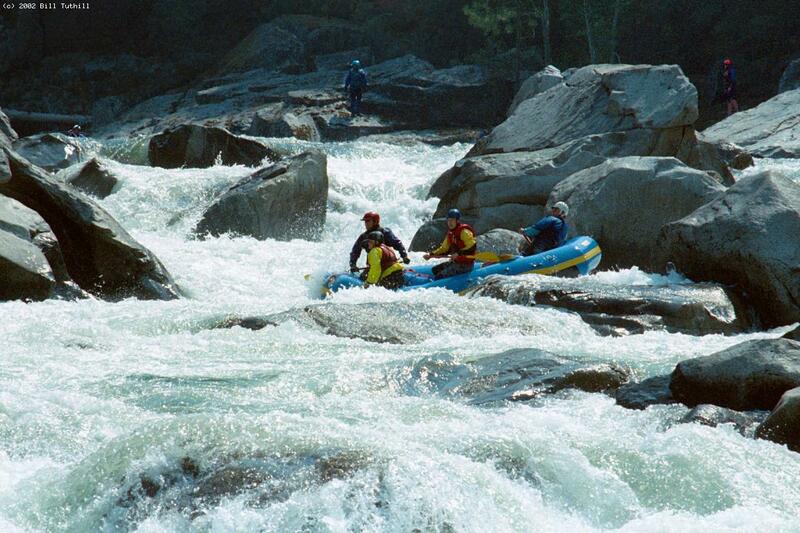 If you really want to inflatable kayak this run, which has been done many times, so far without loss of life, the best plan is to phone Sierra Mac to schedule a commercial rafting trip (800-457-2580 or 209-532-1327). Or if you are friendly with expert rafters, you could volunteer to bow paddle. Either way you can learn the river. Study the mile-by-mile guide before and after your trip. 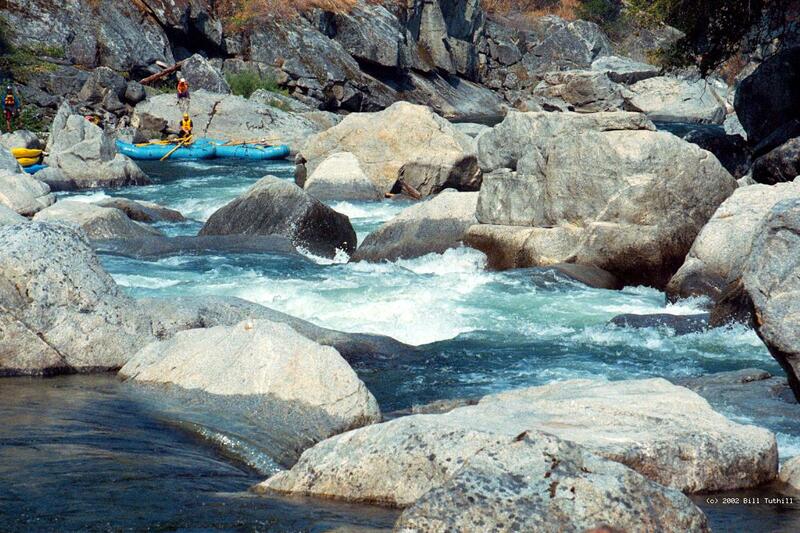 Once you know the river, wait for relatively low water, say around 800 cfs, and boat carefully all day. Lower flows are not beneficial because they expose more boulder tunnels without significantly reducing problem hydraulics. One final note: the Cassady/Calhoun book mentions Coffin Rock near the end of Miracle Mile, without saying that the river lulls you into thinking you should stay center, which is wrong, because the center chute takes you right into Coffin Rock. A boater died there in 1992 when a raft overturned against Coffin Rock. The best route is far right in a narrow channel among big boulders. For years the put-in was at a primitive camp on river right below the bridge, but now (2002) most boaters use a dirt slide from a parking area on river left. Just around the corner from put-in, the river widens into a rocky drop. The left channel, against a cliff at the bottom, is very shallow and can flip rafts. The right channel is less obstructed. Confluence of Cherry Creek and the main fork Tuolumne, which should have less water when you do this run, being impounded by Hetch Hetchy. Easy hike up to the road, for people who want to quit now. Another unnamed shallow rocky drop that can flip off-course rafts. The far right channel is usually runnable, but very narrow. The more-normal route is the middle of the wide left channel. On the far left of this channel, an undercut rock lurks below the horizon line. Big boulders at the top obstruct your view of this very steep rocky drop. Most boaters run it down the middle. A boulder jumble followed by severe whitewater, a short pool, then another big rapid called Toadstool. 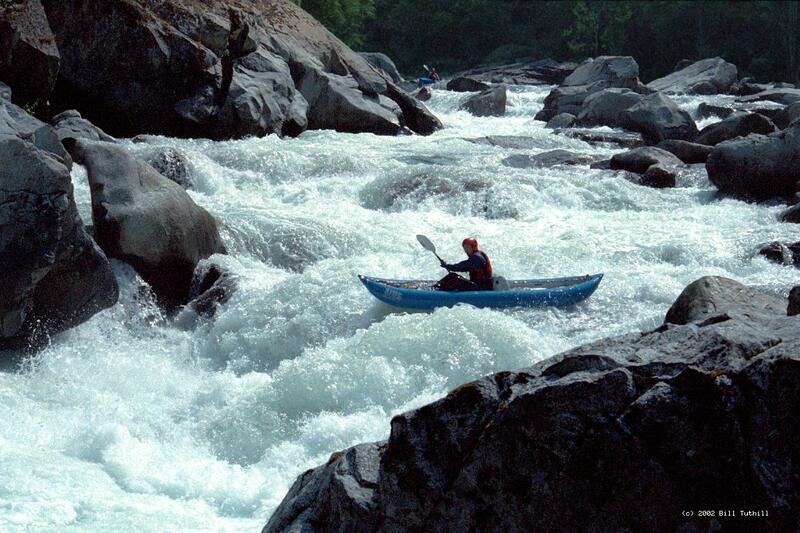 Rafters usually start on the river-left side, turn sharply right into the Cattle Call, backpaddle, then either drift down the right side near Skull rock, or ferry back to the left of the foaming Mushroom formation. Kayakers usually start by running a falls on the far right, hugging or eddy hopping along the cliff on the right bank, then make the same right or left side choice as rafters. The final drop looks bad but seems somewhat forgiving. Most of the current splits around a pyramid rock. Going right leads to a multistage class IV+ drop. Going left (a mistake) sometimes leads boaters into an inescapable eddy, or at best, a steep rough drop. 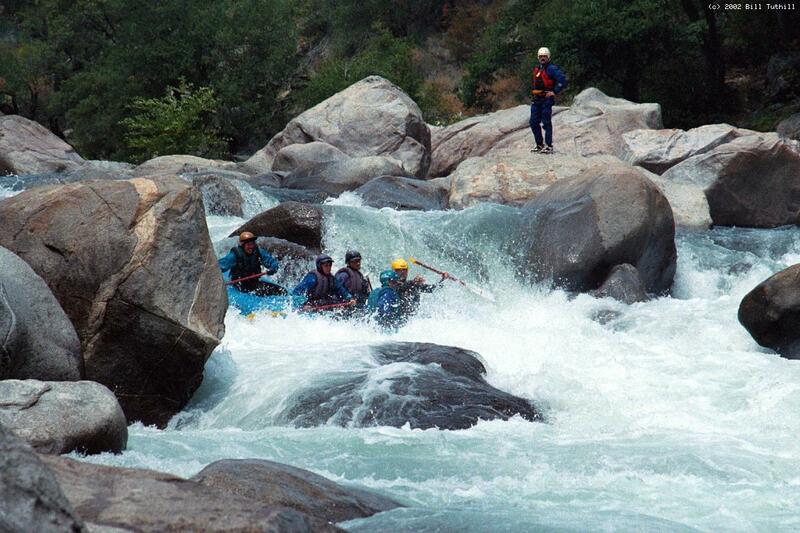 Class IV rapids follow shortly below. After a long class IV boulder garden, a cable crossing overhead indicates the final steep drop ahead. Boulders block your view. The right channel falls into a big hole, while a narrow channel angling left-to-center offers somewhat of a sneak route. There is no definitive beginning or end to so-called Miracle Mile, it is just an accident of distance measurements from put-in. A very large hole against the left-hand bank, easily negotiated by narrow kayaks, but rather sticky in rafts. This is followed by a very long boulder garden, a bad place to swim. 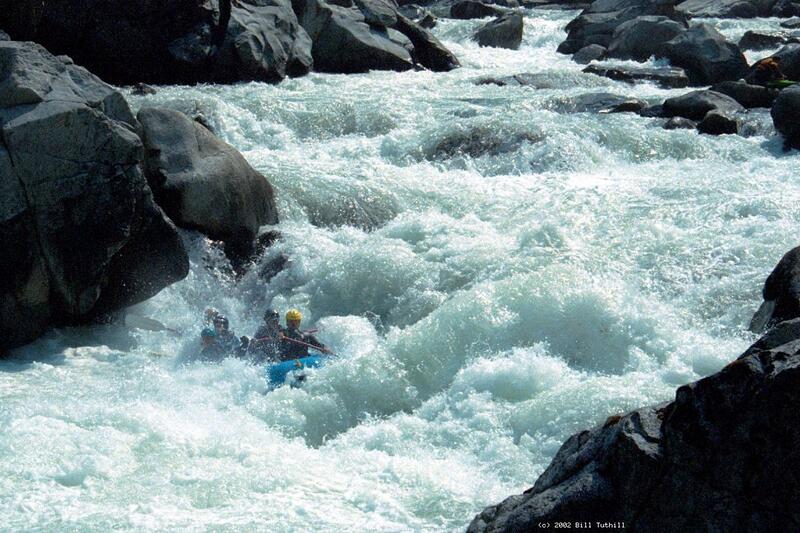 Blind Faith, the name of the rapid that leads into Coffin Rock (see introduction). Stay far right, then traverse left just below Coffin Rock, which recently fell over (2002). Another mile just as difficult as Miracle Mile, but not as steep. This includes a boulder slalom, a wide and shallow rock garden, a wrap-rock slalom known as Lombard Street, then Christmas Hole, a vertical drop of 8 feet. The river turns left and slalom-drops into a sticky hole. The leap itself is in the center, but in recent years an easier route has developed on extreme river right, ending in a traverse to the center, followed by some lesser holes. Actually a series of falls culminating in an apparently dangerous drop onto a flat rock, with lots of water going underneath into a body trap. Kayaks often sneak far right around this drop. If you wait for dam-release flows to recede in late afternoon, lining rafts is a bit safer. It is possible to take out on river right above this rapid, but it is easier to line left, portage Lumsden Falls on the left, then float to the campground. The final drop forces boats against an undercut wall on the right, but boats almost always wash out. A bigger problem is the almost total unavailability of clean entrance routes, especially for rafts. Lumsden bridge overhead. When portaging, drop boats into the water on the rocky left bank just upstream of the bridge. Upper Lumsden campground makes a nice easy take-out, especially if you have run out of dam-released water. There is a wide trail leading up to the dirt road just above where the following rapid swings left around a boulder garden. Against the Wall, class III+, a boulder then bedrock drop on extreme river left. Most boats take the narrow chute-falls on the far right, but the main center drop is perhaps more straightforward. South Fork Tuolumne enters on the left, usually not contributing much water when Cherry Creek is in season. Meral's Pool Table, class IV, a long rock garden. Lower Lumsden campground is high on the left bank. Meral's Pool, an easy take-out and put-in for the lower Tuolumne. For shuttle instructions, see the Cassady/Calhoun guidebook or the Holbek/Stanley kayaking guide. To find nearby food and lodging, type Groveland into the box and click Search.